Vaishali is a city that has immense historic importance and this place is circumscribed with mangroves, banana trees and rice fields. 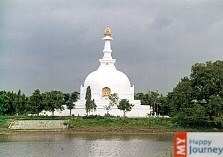 The major tourist attraction is the magnificent Buddhist sites that the city of Vaishali possesses. The historic roots of the place can be traced from the times of Ramayana and Mahabharata and it derived its name from King Vishal. The city got the title of capital city of Licchavi state prior to the birth of Lord Mahavira. The fact that Lord Mahavira was born in this city gave a lot of spiritual importance to the place. With great contributions of Lord Buddha, Vaishali gained popularity and the city conducted the second major Buddhist council on completion of hundred years of Buddhism. Historians believe the city evolved as the first republic of the world during the 6th century consisting of a representative body that was elected. A really large pillar stands next to the brick stupa at Kolhua as a remembrance to the Buddha’s sermon and nirvana. Vaishali is a must visit place from religious, cultural & archeological view point. The major attractions of Vaishali are Ashokan Pillar, Buddhi Mai, Buddha stupa, Raj Vishal ka Garh etc. Vaishali is famous for Vaishali Mahotsava that celebrates birthday of Lord Mahavira. Also Sonepur fair is popular too that is held at a distance of 35 km from the city. Paintings, stone sculptures etc are other important attractions. The art and craft of Vaishali is also famous which mainly includes lac bangles and homemade toys. The “sikki work” is also particularly popular and the litchis of vaishali are famous too.